Fin – The American economy is thriving. Why do so many of us feel stuck? The U.S. political landscape of the last few years has left many of us wondering what we’ve missed. The economy has been flourishing, and the growth of the tech sector has opened up new opportunities across the country. Yet much of the country isn’t feeling the love. In fact, a recent survey by the Center for Financial Services Innovation found that just 28% of Americans are financially healthy. In this article, we’ll examine the disconnect and explore how new technology can help improve Americans’ financial lives. When it comes to examining the health of an economy, you can look at a wide variety of indicators to see how things are tracking. And in macroeconomic terms, the U.S. has been crushing it (that’s a technical term) in recent years. The long-term performance of the stock market (as opposed to day-to-day volatility) is often considered a good leading indicator of economic health. A strong market is partially a result of strong earnings estimates, which can indicate a thriving economy. If companies are slashing their estimates, on the other hand, this generally indicates that they’re expecting fewer sales—perhaps due to a weaker economy. "Sustained job growth since 2010 means that it’s easier to find a job now than in the past. But when you adjust for inflation and cost of living, wages for most American workers have hardly budged for decades." 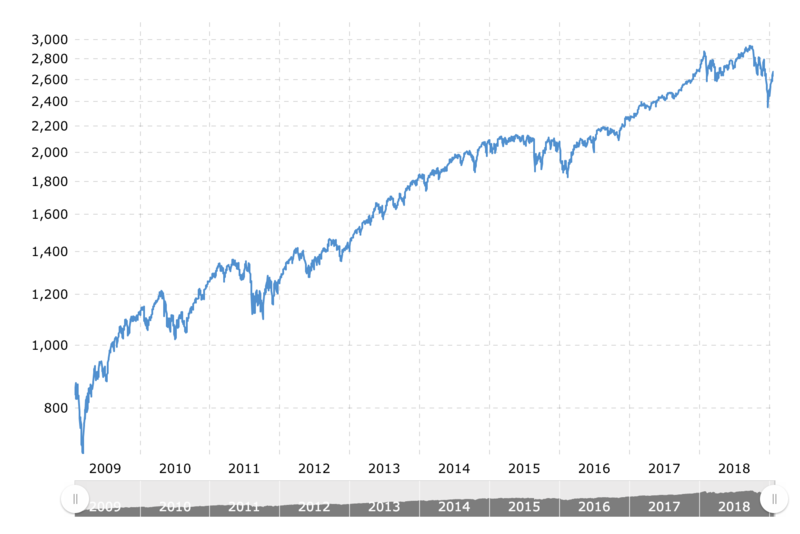 The S&P 500, a stock market index based on the largest 500 companies in the NYSE and NASDAQ, has been rising since 2008, hitting new highs each year. While the last quarter of 2018 and early 2019 have been less impressive, it would be difficult to argue that the last ten years do not represent a period of growth. On the same note, stock market returns (which take into account the entire market, not just largest companies) have been positive since 2008, up to a high of 32% in 2013. Positive returns are also indicative of financial growth on a microeconomic level; that is, when returns are higher, anyone invested in the stock market profits. Given that financial advisors recommend up to 100% of an individual's’ investment portfolio be allocated to equities (i.e. stocks), positive returns can have a big impact on individual net worths. Other economic indicators have been positive for the American economy in recent years, including GDP and unemployment rates. GDP growth is regarded by many as the single best indicator of economic growth. While the US GDP hasn’t been breaking records, growth rates have been positive since the end of the financial crisis. Unemployment rates have also been steadily decreasing, hitting a 49-year low of 3.7% in November of 2018. Taken together, these indicators paint a pretty picture of the U.S. economy. But critics point out that these broad strokes not only potentially miss what’s going on beneath the surface, but are also subject to manipulation by a number of different parties—with the 2008 financial crisis being a prime example of masked maladies eventually bubbling to the surface and creating widespread chaos. Indeed, when we dig deeper into the current state of Americans’ finances, this near-perfect portrait begins to crack around the edges. These metrics point to robust growth—but precisely what kind? Sustained job growth since 2010 means that it’s easier to find a job now than in the past. But when you adjust for inflation and cost of living, wages for most American workers have hardly budged for decades. And that’s just the tip of the iceberg. In fact, a closer inspection reveals that most Americans haven't been enjoying the current economic boom in the U.S.
"Americans with savings accounts have a median balance of $5,200 per household. Meanwhile, the average family carries a monthly credit card balance of $6,375." When it comes to personal savings, best practices suggest that each of us maintain two main pots of spare cash: emergency expenses and retirement. Americans aren’t doing well on either front. According to a 2017 survey, 40% of adults wouldn’t be able to cover an unexpected $400 expense—meaning they would have to sell something or borrow money in order to make ends meet. With the average hospital stay in the U.S. costing more than $10,000, many Americans would be hard pressed to cover even a fraction of a surprise medical bill. In fact, approximately 27% of U.S. households don’t even have a savings account. According to the Federal Reserve's Survey of Consumer Finances, Americans who do have savings accounts have a median balance of $5,200 per household. At the same time, record high credit card debt eclipses those savings, with the average family carrying a monthly balance of $6,375. Hundreds of millions of Americans are failing to save for retirement. One study found that 21% or respondents have saved nothing, and a third have less than $5,000 in retirement savings—leaving about half of Americans underprepared for what might have been their golden years. Meanwhile, American debt levels hit a nine-year high in 2018, totaling $13.29 trillion due to growth in mortgage (68% of all U.S. consumer debt), auto loan (9%), and credit card debt (6%). "70% of American college students graduate with student loans. Research has shown that it’s increasingly difficult for them to reach the next rung of the American dream: to get a car, buy a home, or start a family." Student loans are another debt in the pile, accounting for 11% of consumer debt and averaging $37,172 per student who carries them. An estimated 70% of Americans who attend college graduate with loans, meaning that the large majority of educated Americans begin their professional careers buried in debt. Research has shown that it’s increasingly difficult for these indebted students to reach the next rung of the American dream: to get a car, buy a home, or start a family. Why the discrepancy? Surely someone is reaping the benefits of a booming stock market, growing GDP and wages, and decreasing rates of unemployment. There’s no one answer, but many point to growing wealth inequality as the primary reason we can’t reconcile these two narratives. In 2015, the top 1% collected 22% of all income in the U.S., with the top 1% of families making an average of 26.3 times more than the remaining 99% of Americans. As the wealthy earn more each year, the middle class’ share of the country’s wealth continues to drop, and the bottom 40% of Americans increasingly see negative net worths. "In 2015, the top 1% collected 22% of all income in the U.S., making an average of 26.3 times more than the remaining 99% of Americans." It’s difficult to pin down the precise causes of this inequality, but misaligned incentives are a key piece of the puzzle. Too often, the banks and financial service providers who control the flows of capital profit from consumer confusion and error. Consider, for example, a borrower who takes on a loan she doesn’t understand or can’t afford. Because these institutions profit handsomely from the status quo, they are only weakly incentivized to offer her a better alternative. For many Americans, getting the financial products and services you need can feel perverse, even maddening. The worse your credit, the more expensive it is, leading to a world in which you less likely to be able to pay down your debts. The system looks this way for a reason: financial institutions are looking out for their bottom line and thus charge more money to consumers they deem higher-risk. But it doesn’t have to stay that way. Imagine a world in which incentives between consumers and the financial institutions that serve them are more closely aligned. Imagine a bank that uses alternative consumer data—things like income, bank account balances, and total assets—to determine creditworthiness. Simply by moving consumers from higher-risk to lower-risk categories, such a bank would help them reach their goals. When it comes to helping more Americans share in the national prosperity, there are two basic approaches: Create more wealth for working Americans, and help them maintain the wealth they already have. On the first point, policy has the potential to create widespread and significant change. Everything from tax law to family leave and childcare policies can impact the finances of Americans, creating ways for them to earn more as reduce inequality. But policy takes time, and many Americans need help today. "Here’s one straightforward way to think about fintechs and the products they offer. If all they end up doing is helping those of us who struggle with money to manage our finances as well as the average American, they will have improved the financial lives of over 150 million people." Education is another key piece of the puzzle. Many Americans receive their financial education from family members, which can prove damaging when they inherit bad habits. And knowledge isn’t enough; behavior change is the next (and perhaps more challenging) element of taking control of personal finances. In addition to making Americans more financially savvy, technological and business model innovations are increasingly helping to create low-cost, more accessible financial products—with the right incentives in place to help users make better decisions. While some of these products are being adopted by big banks, financial technology companies (“fintechs”) can be credited with leveraging lower infrastructure costs, data, and mobile to bring better products to market in recent years. Here’s one straightforward way to think about fintechs and the products they offer. If all they end up doing is helping those of us who struggle with money to manage our finances as well as the average American, they will have improved the financial lives of over 150 million people. Acorns is an incremental savings app that enables Americans to start saving and investing without even realizing it. The app connects to a user’s credit card or bank account, rounds each purchase up to the nearest dollar, and invests the spare change in a portfolio of stocks and bonds. Users can also set up periodic transfers into their Acorns account if they want to invest more than spare change. "Many companies are already using better data to help people make more educated decisions, offering products to previously underserved markets, and enabling consumers to take back control of their finances through a variety of online tools." Acorns isn’t looking to disrupt asset management for the wealthy so much as it is bringing investing to everyday Americans. The platform goes beyond the average robo-advisor by offering experiential education and creating habits around incremental savings: When Acorns customers use the app, they see firsthand how quickly even the tiniest of sums can add up—and then when their money is invested, they benefit from learning more about how the market and investments work. Truebill also connects to users’ bank accounts, but for a different reason. The app offers a quick snapshot of users’ financial lives, from cash and card balances to a visual summary of which subscriptions are being paid from connected accounts. TrueBill’s two main features are around subscriptions (everything from Netflix to your Headspace account you forgot to cancel last year) and bill payments. The subscription feature allows users to monitor and cancel subscriptions from the app; Truebill claims 84% of people have subscriptions they’ve forgotten about, indicating that the majority of users stand to save at least a little by using the app. The bill payment feature is a bit more involved, as Truebill actually negotiates to lower bills on behalf of their users. For example, they’ll identify that a cell phone bill looks higher than the average, and then call Verizon to negotiate for a lower rate. Incentives are definitely aligned here—Truebill gets paid based on how much their users save, so it’s in everyone’s best interest to get their bills reduced. In addition to a share of savings, TrueBill also charges a monthly fee for access to their Premium services, such as automatic subscription cancellation and requests for overdraft or late fees. LendUp’s mission is to provide Americans excluded from (or harmed by) the traditional credit system access to quality credit products and the ability to build credit. They offer a lower-cost alternative to payday loans as well as a credit-building card—both coupled with online financial education. LendUp was created to fill the huge gap in U.S. financial services for those with poor credit, who traditionally have little access to banking products and thus turn towards predatory lenders. Between an “emerging middle class” and the rise in tech to support low-barrier to entry education and gamification, LendUp saw an untapped market opportunity. Rather than simply giving a customer a loan they can’t afford to pay back, the company was created to helps people climb the credit ladder through both better products and education. "Rather than giving a customer a loan they can’t afford, LendUp helps people climb the credit ladder through better products and education." So far, it seems to be working. Their customers see improved credit scores when compared to a control group, and their scores improve the longer they use LendUp. While short-term profits might be improved by offering high-interest rate loans, LendUp is taking the long view, betting that a good user experience and improved financial status will lead to repeat customers and referrals—both of which lower marketing costs and make for a sustainable business model which is also favorable to consumers. While the economic data may look promising, on an individual level many Americans are struggling to make ends meet. While policy shifts are an important part of the long-term solution, fintech isn’t waiting around for the government to make changes. Many companies are already using better data to help people make more educated decisions, offering products to previously underserved markets, and enabling consumers to take back control of their finances through a variety of online tools. As we’ve seen before, the best answer will involve collaboration among all stakeholders—including policymakers and big banks—but technology is in many ways leading the charge toward a more equitable financial system in the United States.